Cats are special however they are depicted; these are free spirits. 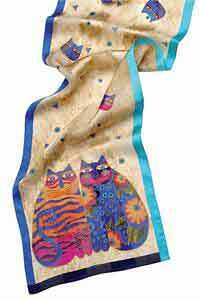 This is a silk scarf with original artwork authentically created by Laurel Burch. Unbelievably soft, high quality silk and vivid, colorful Lauren Burch design makes this a perfect gift. Laurel Burch scarves have hand-rolled hems; this one is embellished with sequins. Silk scarf is approximately 53" long by 11" wide.